2010 has flown by and as you know, so much has happened nationally, state wide and at MD Headquarters The Home of MDA. One federal and one state election, the breaking of the drought, and increased interaction with the Federal Government have all presented opportunities to further the MD cause. The lead-up to each election provided ample opportunity to showcase MD research, MDA programs and table issues. The breaking of the drought increases choice for CampMDA sites and improves the potential for our community members who live on the land. Your MDA has also played a significant role in the development of a National DMD Register as well as establishing a soon to be launched DMD Information Service. From the launch of My Diverse Australia to the unveiling of the National DMD Registry, and heaps in between, MDA has strived to improve its support to the MD community. Most notable is the establishment of a capability to visit those in the MD community who are geographically or socially isolated. Sure, we have had a fair share of obstacles, but your MDA still stands tall as the lead provider of MD support and services in Australia. These services address identified service delivery gaps and respond to client expectations..
We are proud to say that our programs and services continue to be A1, including CampMDA which is regarded as “best practice” and has delivered more than 486,000 hours of respite over 79 instances of camp. It’s so pleasing to receive the positive comments from around the globe. Along the way, we have lost a number of our clients, which saddens me as many are people who we have, come to know so well. However we will never gave up the MD fight, but we are determined to continue pushing the boundaries when it comes to research and scientific and medical endeavors. It is not a case of simply wanting to, it is the case of having to – we have no choice but to continue this journey until we find a timely solution. That is the answer, pure and simple. It is the struggle of our daily lives, which makes us stronger. Whether it is the struggle for me and my dedicated Team to work with governments, corporates or the public to find that extra dollar, or the struggle to fund equipment and services or it is the daily struggle for our clients to start a new day. The struggle will make us hungry for answers and solutions. 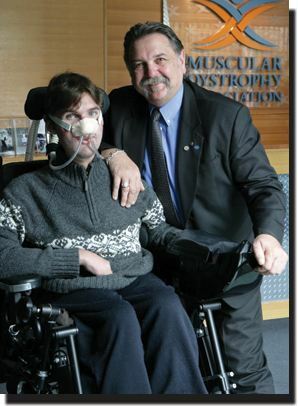 MDA is a Team, and one that members of the MD Community can be so proud of. I see the day-to- day challenges confronting our community and I see the resolve of your MDA Team striving to Make a Difference! The MDA Team is all of us! Perhaps the highlight for me was sharing the tough journey trekking to 4,169 meters through Nepal. And the Team comprised no less than Dads, Aunties, Scientists, each touched by MD in some way, each trekking that extra yard, each wanting to influence the outcome MD currently presents. In fact, ChallengeMD 2010 Nepal brought us 1.6 million steps closer to that! While I am determined to continue to fight for the MD Community, I do it better in company. Sometimes I and others ache for more support, more encouragement from the very community who needs us. While I applaud each MDA Team member, I want to expand the team to include each and every one of you to energise us to climb that mountain that is MD! We will begin 2011 with more challenges and obstacles, but along the way, we will undoubtedly find new solutions that may help create a better day, a better way or less affray for our clients. I hope that 2010 has brought you happiness and from all of us at MDA, we would like to wish you all a very Merry Christmas and a safe new year. We band together again in the hope that tomorrow will be even a better day.